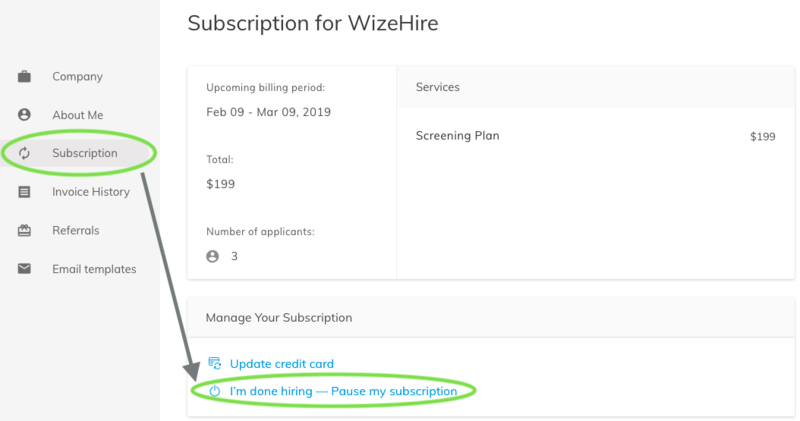 How do I cancel or pause my WizeHire account? It's super easy to close or pause your WizeHire account. Next, click 'Subscription.' If you see the 'I'm done hiring - Pause my subscription' link, you'll be able to pause or cancel your account without our assistance. You'll be asked a few quick questions and then voila, your account with us will deactivate at the end of your next billing cycle automatically, it couldn't be easier! While you're away you will not be able to access your complete dashboard, but we can share a .csv file with you that contains all of your applicants' information. You may download it during the closure process if you're able to pause your account on your own, or just ask us to send it your way! When you're hiring again and want to reactivate, all of your ads and applicants will reappear in your dashboard.